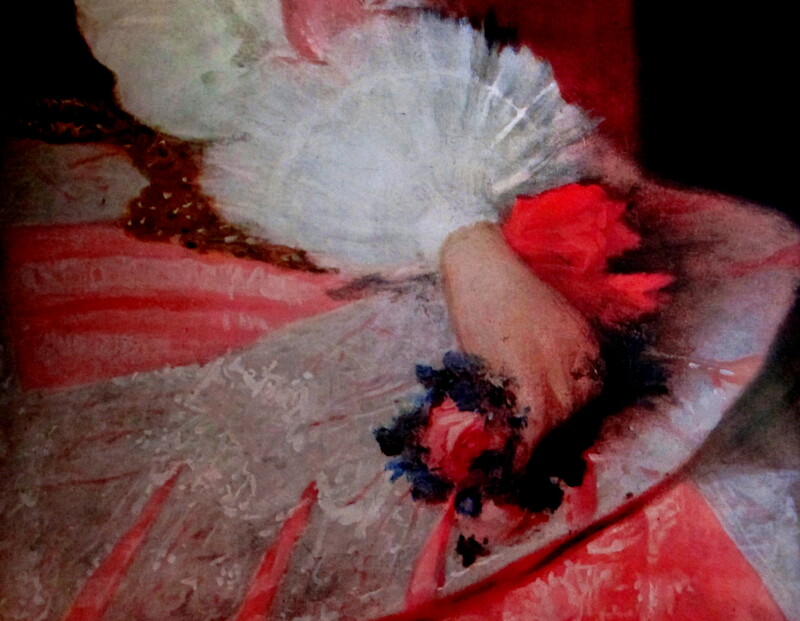 This is a detail from “Las Meninas” (1656) a portrait of the Infanta Margarita Theresa, by Diego Velázquez. (It is held at the Prado Museum in Madrid). Diego de Silva y Velázquez, was baptized in the Andalusian city of Seville, on June 6, 1599, into a family of modest means with Portuguese origins. He began painting under Francisco Herrera the Elder and Francisco Pacheco, before moving to Madrid where he spent time in the Prado Museum and the Escorial. Summoned to Madrid by Count-Duke Olivares, the Minister of the boy-king Philip IV, he became an official painter and was accepted into the ‘inner circle’ of the Royal family. Velázquez suffered a breakdown and abruptly died in Madrid on August 6, 166o. Tragically, his wife survived him by only one week. He was supposedly buried at the San Juan Cemetery, however, his grave has never been found. The Cemetery and Church was destroyed in the 1800s. It was during Spain’s 400th anniversary celebration of Velázquez’s birth that a renewed search for his tomb was conducted. The dig began on April 30, 1999, at the Plaza de Ramales, one block away from the Royal Palace; as this appeared to be the place where the medieval Church of San Juan once stood. The result was inconclusive. Like many mysteries – the simplest answer I frequently hear is – “Oh, it can’t be found. A car park has been built over the top of [whatever we are looking for] therefore we cannot confirm/deny [its/whatever] existence. If that is the case, May it all “Rest in ashphalt” (RIA) – not! This entry was posted in Gallery Art, OilPainting, Paintings and tagged Diego Velázquez, Golden Age of Spanish Art, Infanta Margarita Theresa, Las Meninas, Philip IV of Spain, Prado Museum. Bookmark the permalink.